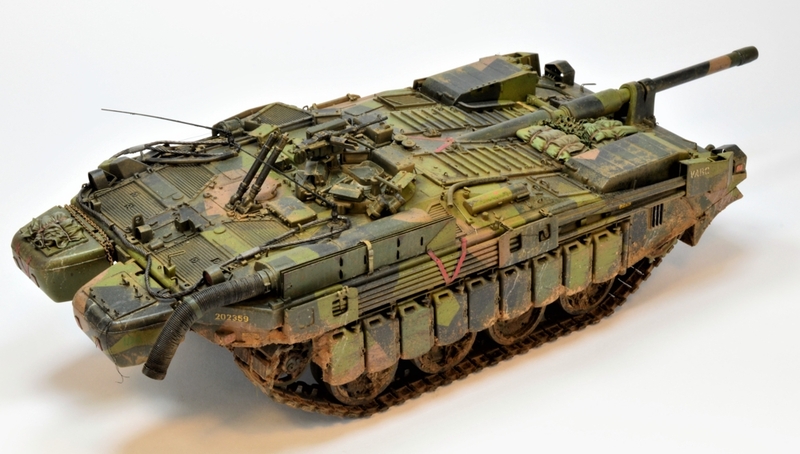 "The Stridsvagn 103 (Strv 103), also known as the S-Tank,[Note 2] was a Swedish post-WWII main battle tank. It is known for its unconventional design: it was turretless with a fixed gun traversed by engaging the tracks and elevated by adjusting the hull suspension. While turretless armoured fighting vehicles are usually classified as assault guns or tank destroyers, despite its unique gun laying process[full citation needed][infringing link?] the Strv 103 is considered a tank because its designated combat role matched those of other tanks within contemporary Swedish doctrine. It is the only mass-produced tank since World War II to dispense with a turret. 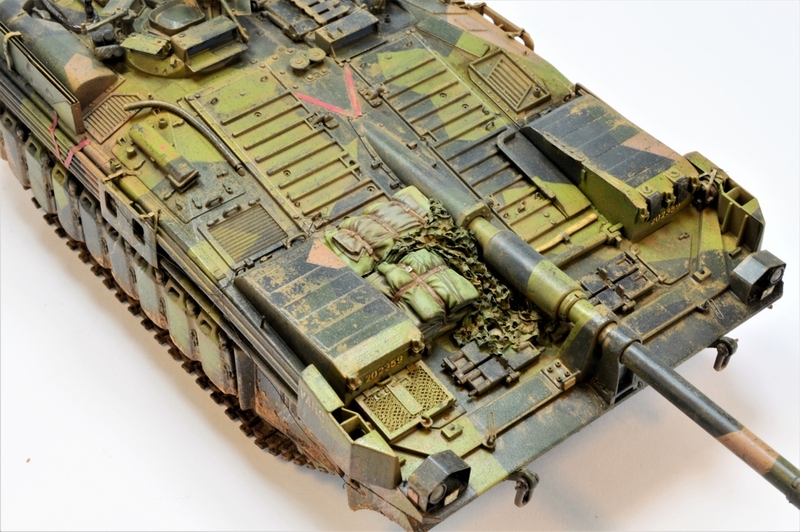 The Strv 103 was designed and manufactured in Sweden. It was developed in the 1950s and was the first main battle tank to use a turbine engine. The result was a very low-profile design with an emphasis on survivability and heightened crew protection level. 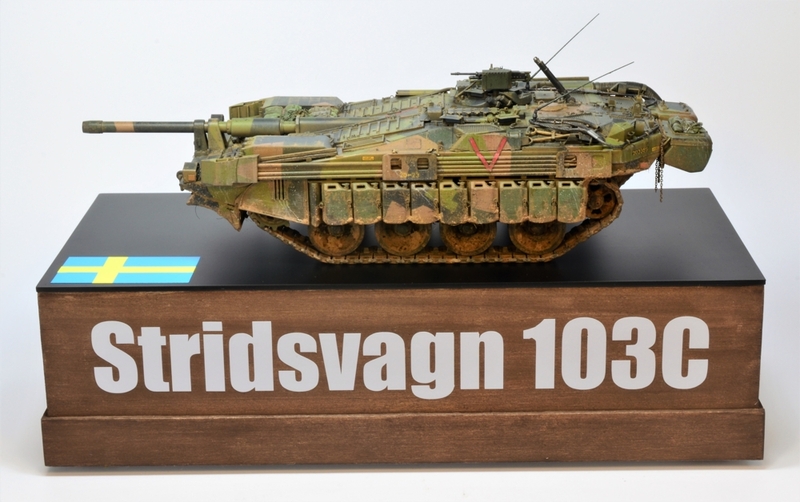 Strv 103s formed a major portion of the Swedish armoured forces from the 1960s to the 1990s, when, along with the Centurions, it was replaced by the Stridsvagn 121 and the Stridsvagn 122, variants of the Leopard 2"
I do love that tank. Pretty impressive that it stayed in service from 1967 until 1997, and was the equal of the M60A1 in gunnery competitions. Yep, very cool, and very, very, low profile, especially when dug in with its own dozer blade. I always liked this tank. I have a platoon of them in 1:285 that I'm sure I'll paint someday. I've got some in 1/144th, and looking forward to playing with them, though with mods for their low profile, and digging in, it appears to be nigh impossible for their opponents to destroy them with direct fire, which is a bit problematical for a good game. Sure, perhaps a lucky ATGM shot might hit (but then again, due to the armor's angle its probably more likely to bounce and not detonate at all), and/or you can try to use artillery or waves of infantry to winkle them out, but they're going to be a tough nut to crack, I expect. Might have to craft some special rules to make that work, with the more granular tank rules I am considering. Best solution is to probably use helos or jets, but those will have to deal with the Viggens and Drakens down low, which won't be an easy task either, especially with the former's data-link capabilities. The Sweeds considered it could stop and train it's gun on target faster than a turreted tank. At that time it was Policy to stop and fire turreted and otherwise. It had a bigger gun than its equivalent tank and it's fire control was said to be faster and better than a conventional tank. It was tried by the Brits who were seating about it. However the Sweets said the brit crews were not trained sufficiently and also Swedes crews were allowed to train and fire at observed targets. The Brits needed the commander to agree to shoot. This lost a vital second or so in a shoot out. Basicaly the S tank needed it's own approach and the Brits did not like/understand this. My understanding of its final demise was that as AP rounds developed the advantage of sloped plates disappeared and it was impractical to up armour the tank to modern standards. Plus of course stabilisation became very effective whereas the S tank did have to stop to fire. 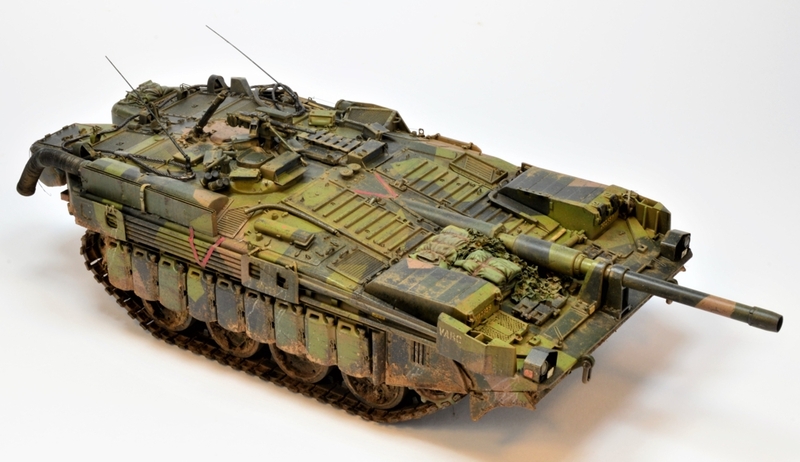 I have looked at gaming these but really although there are 1/144 versions the accompanying APC's are not available so I have not yet bothered to work how to model this tank under our rules though I do have some ideas. Ps the Swedes invented bar armour for the S tank, though they kept it secret untill the 70's if I recall. Bovington has one with the bar armour in place. PBV 302s are now available from Minifigs, plus the S-Tank, and their 91 infantry tank too. Apparently, you only need 3 x APCs to go with a company of S-Tanks (13 based upon one TO&E I've seen). I plan on using some of the prepainted, 1/144th scale tanks for my battles. Now, where did I put those unbuilt, 1/144th Viggen models? I need to annoy Armies Army or Geoff at QRF again about getting some ca1985 Swedish infantry made. The later 125mm sabot rounds would just about through-and-through on an S-Tank, since the Soviets had figured out how to ignore armor slope. I've heard that, but getting the round on target, vs. a dug-in S-Tank, will be very difficult indeed, assuming they even spot it before they're killed. Looks to me like about a one foot high target, if properly dug in, and with its weapon showing. Hitting that's gonna take some fancy shootin' as they say out west. It's looking tempting, can somebody put up an OOB for a company group using the S tank. I need the kit for the infantry as well. At 1/144 I can bodge the infantry, but I do have a Carl Gustaf team anyway. I have the early, mid-1960s data, and also 1980s. Both show 13 x S-Tanks per company; 4 platoons of 3, plus 1 in the HQ. I ran across one on-line org. which doesn't mention the extra tank in the HQ, but also doesn't provide any info about it, so I suspect the 13 number is correct, and not just the 12 listed. There's 3 x PBV-302s attached to the tank company. For the Infantry Co.s, it's 10 APCs. 1 in the HQ, and then 3 x 3 platoons. Seems as if they cross-attach like the Germans, so you can probably add in 3 x S-Tanks to support them, if desired. 1 x CG per squad, later. Apparently, early on – 1960s, looks like only 2 x CGs per platoon – presumably due to scarcity/costs. IKV-91s are 4 per platoon, with 3 platoons. I don't think they have another in their HQ, so appear to be treated more like mobile artillery pieces than light tanks, from that respect, if that is true. We're gonna need those little Swedish "jeeps" (can't recall their designation right now), with the 90mm recoilless rifles – 40 of those in an armored brigade, apparently. Appears they are in the A/T units, scouting units, and other orgs..
Any chance of you producing one of those, and the little Spz Kurz? Still want/need the little Spz Kurz w/20mm cannons for my West German recon units – they used those up into the 1970s apparently. They also made an 81mm mortar variant, which I'd like too, so double the bang for minimal modifications for the second vehicle, I suspect. There's a Beob too, for a third one. I need all of those. Would love some prone infantry too, for US (M-1 helmets), West German (M-1 helmets), Soviets, Swedes, etc..
May need Centurion 10s too, with the 105mm cannon. Not sure how they really differ from the Mk. 5, so perhaps the earlier model can stand in for it. Probably works for Danes too. Glad you like it too boys.